Samsung and Apple call up their own customers, slaps $ 126 million. If you are using the company's phone, then the company slows the function of an excuse to update your smartphone, then you probably do not understand this. But due to this, the penalty of Rs 126 crore has been imposed on two world-famous mobile manufacturer companies Apple and Samsung (Samsung). 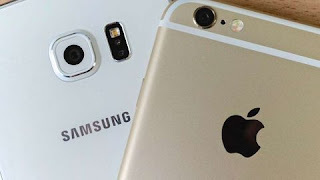 Apple has fined 84 crores and Samsung has been fined Rs 42 crores for slowing users' phones. You may not believe this at first for the first time, but this is 100 percent true. It has been revealed in a report. It has been reported in the report that both the companies have done this work with the entire plan. It was believed that after updating the operating system of the old phone, the speed of the phone will slow down and after that the customer will have to worry and get a new phone. This was the motive for benefiting the company in the overall overall. The penalty has been imposed on behalf of Italy's anti-trust authority. The Authority also said that both companies are involved in unscrupulous commercial practices. Italy's Competition Commission (AGCM) also said that both the companies deliberately slowed the customers' phones on the pretext of software updates and spoiled their function, so that consumers can buy a new phone again. The report said that since September of 2016, Apple has been repeatedly sending notification of its software update to customers of their iPhone 6, which was made keeping in mind the next generation model, iPhone 7. is. The company did not tell the users that this update will make their phone slower and its function will get worse than before. On the other hand, Samsung asked the Galaxy Note users to install a new version of Google's Android operating system, which was made keeping in mind the recent Galaxy Note 7. Due to this update, old phones from Galaxy Note slow down.